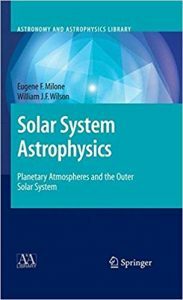 Solar System Astrophysics opens with coverage of the atmospheres, ionospheres and magnetospheres of the Earth, Venus and Mars and the magnetosphere of Mercury. The book then provides an introduction to meteorology and treating the physics and chemistry of these areas in considerable detail. What follows are the structure, composition, particle environments, satellites, and rings of Jupiter, Saturn, Uranus and Neptune, making abundant use of results from space probes. Solar System Astrophysics follows the history, orbits, structure, origin and demise of comets and the physics of meteors and provides a thorough treatment of meteorites, the asteroids and, in the outer solar system, the Kuiper Belt objects. The methods and results of extrasolar planet searches, the distinctions between stars, brown dwarfs, and planets, and the origins of planetary systems are examined. Historical introductions precede the development and discussion in most chapters. A series of challenges, useful as homework assignments or as focusing aids, are presented at the end of each chapter.